Companies that have traditionally advertised in the phonebook and being asked to use the Yellow Pages 360 platform to continue using their ad spend with Yellow Pages. As more and more companies pull budget from print company, owners are looking at other options to get a better return on their marketing investment. Many of these company owners are turning to digital marketing; Organic Search Engine Optimization, Social Media, Google Ads (also called PPC, Pay-per-Click, Digital Ads or SEM) and landing page creation. Before we jump into answering “Is Yellow Pages Online Worth It?” let’s take a look at Google Trend to see how many people search for Yellow Pages. As you can see from this Google Trend report since 2004 the number of people searching for Yellow Pages has dropped massively. So Is Yellow Pages Online Advertising Worth It? I’m going to answer this question based on personal experience from clients moving over to us, and research performed online. You’re going to be paying a lot for clicks to your website. When we get approached by a company looking to move their digital marketing from Yellow Pages to us, we can pretty much guarantee a better return. Take a look at this chart, the data on the left is the last month of a Personal Injury Law Firm using Yellow Pages for their Digital Ads within two months our agency was able to reduce the cost per click by half, triple the exposure of adverts (impressions) and still increase the number of visits to their website. This meant more business and less budget being wasted. I suspect this is due to lack of actual work ON the account; not tracking negative keywords, not segmenting converting keywords, not A/B testing ad copy – all things that improve the performance of an account – which by the way are all things you have no access to if you’re using Yellow Pages to run your Digital Ads. Let’s start with this, possibly the biggest customer pain. The contract. Long contracts will no outline of the scope of work. Particularly with Organic Search Engine Optimization, we found clients had no idea what they were paying for and why. We had one dental clinic pay $4,000 per month for search engine optimization. Unknown to YPG we had we built their website and for 6 months we were never asked for the log in details of the website. Details that are critical to the optimization of the website. What makes things worse if the auto-renewal clause – hundreds of people get caught out with this every year. This forum shows some of the recent feedback. Digital marketing is so critical to the growth and success of your company, why would you want to get stuck in something you can not get out of. A year is a long time in digital marketing. You would hope that the team in charge of generating you leads online is a happy one. Sadly Yellow Pages have some of the most unhappy employees in Canada. 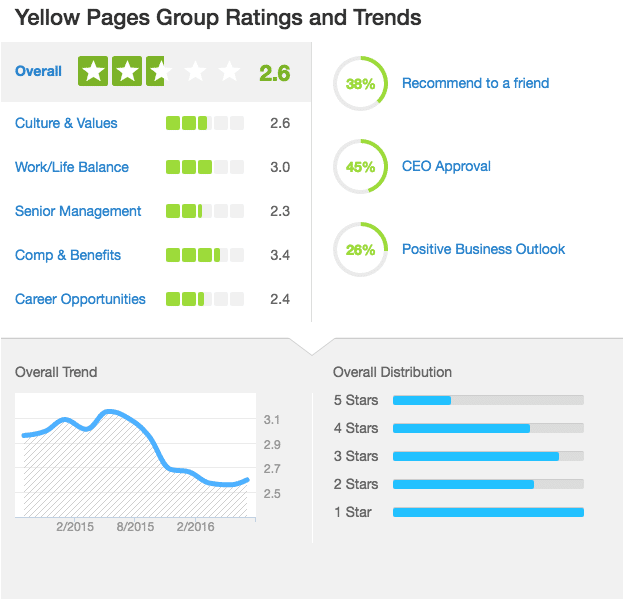 This recently updated dashboard from Glassdoor shows a continuous drop in staff reviews, a crazy 2.6 out of 10 – and that’s their own staff! So is Yellow Pages Advertising Worth It? Yes….as long as you don’t mind paying double what you should be, being stuck in an eternal contract and having no customer service or progressive work done on your account.